I have said this before that homes are like a summary of experiences. 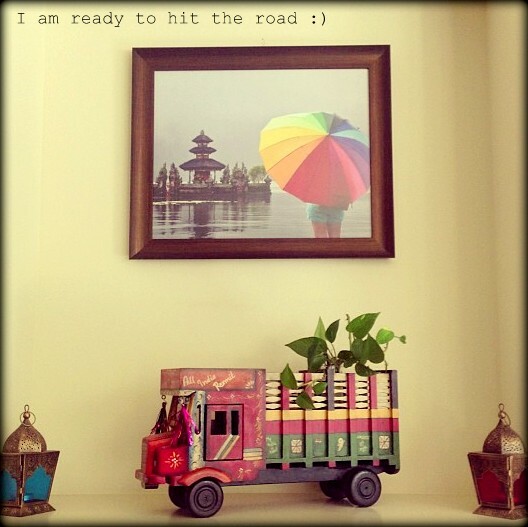 For me my home reflects where I come from, my personal taste and my travels. While we shop and stores, buy pretty things and decorate our homes......what makes it unique is how we present it! So don't be afraid to be different, live your life and your experiences through your decor. You will be surprised how much fun it can be :) What are some of the fun and interesting things you have in your home that are uniquely you......I would love to know? Sharing a nook from my home! Image: My Home a subject to copyright! I heart the truck plant holder Anu. I totally agree with you.It's the little quirky and odd finds that make a house a home. An interesting find from my home, would be the vintage wooden utensils that I bought from my vacation to Cochin. I have a lot of vintage pieces that were purchased, but the most important pieces have been passed down from my grandparents, to my parents, to me. Absolutely agree about how it is your touches and your vision that make a house a home! And how it can be a mix of many things and styles! Such a colourful corner. The truck looks lovely. Thank you so much for all your comments. These dscussions are what makes my blogging journey so worthwhile. Oh I love your blog and beautiful house. I just adore that little truck. Such a colorful & beautiful corner.I was in search of a similar truck but couldn't find it. Today I discovered your blog and came to know that you are in Seattle.